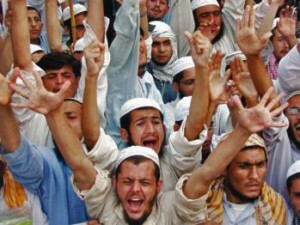 Muslim extremists packed into courtroom erupt in celebration. LAHORE, Pakistan (Morning Star News) – In spite of protests within Pakistan and abroad against the country’s blasphemy laws, the Lahore High Court today upheld the death sentence for a Christian mother accused of insulting Islam’s prophet. Aasiya Noreen, commonly known as Asia Bibi, is the first woman to be sentenced to death for blasphemy in Pakistan. Arrested in June 2009 after Muslim co-workers in a berry field 60 miles west of Lahore beat her when she refused to convert to Islam, her death sentence was announced in November 2010. Bibi’s husband, Ashiq Masih, told Morning Star News that they were hoping for some relief but that the verdict had devastated the family. Bibi’s lawyer, Naeem Shakir, told Morning Star News that Justice Anwarul Haq and Justice Shahbaz Ali Rizvi had rejected her appeal even though there were glaring contradictions in the witnesses’ testimonies. In addition, the court did not take into account the fact that the First Information Report (FIR) against her was registered six days after the alleged incident, “which clearly shows that the case was a premeditated conspiracy against the Christian woman,” he said. The lawyer said that the complainant in the case, Qari Salem, was not even present in the berry fields where the alleged incident had occurred. “One of the witnesses, a female co-worker of Asia named Maafia, used to study the Koran from Salem’s wife, and we believe that she is the one who provoked Salem, a prayer leader of the village’s local mosque, to lodge a case against Asia as she and her sister, Asma, had an altercation with Asia in the berry fields over drinking water from the same bowl,” Shakir said. Bibi’s appeal had been delayed several times, but he had been confident that the verdict would be overturned, he said. “I was shocked when the judges decided to uphold the sessions court decision,” he said, adding that the court had said that Noreen’s “confession” before villagers was sufficient evidence while ignoring that any such confession might have been coerced by Muslim mob. “We will appeal the decision in the Supreme Court,” he said. Given huge backlogs at the court, however, Christian rights lawyers said it would probably be at least three years before the appeal would be taken up. The courtroom was packed with clerics and members of Islamist extremist groups who supported the prosecution, and they erupted in celebration upon hearing the two-judge panel’s decision to dismiss Bibi’s appeal. “Let us celebrate by distributing sweets!” said one cleric who recited verses from the Koran throughout the almost two-and-a-half-hour court proceeding. Salem’s lawyer, Ghulam Mustafa said the court’s decision, was correct. “Asia’s lawyer tried to prove that the case was registered on a personal enmity, but he failed to prove that,” he said. David Griffiths, Amnesty International’s deputy Asia Pacific director, called the ruling a grave injustice. The ruling is the latest chapter in a long ordeal for Bibi, whose case has focused international attention on how Pakistan’s blasphemy laws have become a weapon against religious minorities. While Bibi’s death sentence led to international protests, the possibility of overturning it provoked outrage within Pakistan. Punjab Gov. Salman Taseer was slain by his bodyguard on Jan. 4, 2011 because of his support for Bibi and his criticism of the blasphemy law; the bodyguard believed Taseer, a Muslim, had blasphemed by criticizing the law. Meeting with Bibi after her sentencing in 2010, Taseer had told her he believed the charges against her were fabricated and promised to recommend a presidential pardon. He called Pakistan’s blasphemy statutes “a black law” and called for their repeal. Former Minister for Minority Affairs Shahbaz Bhatti, the first Christian, cabinet-level minister, was shot and killed on March 2, 2011 for calling for reforms to blasphemy laws following Bibi’s trial. Death sentences have rarely been carried out in blasphemy cases, but that is in part because such allegations have frequently led to deadly vigilante attacks on the accused or their lawyers. Pakistan is nearly 96 percent Muslim, according to Operation World, and religiously charged court cases commonly involve clamoring crowds of Muslims and other pressures coming to bear on lawyers and judges. Christians make up 2.45 percent of the population. Mother of two children and stepmother to three others, Bibi was convicted under Section 295-C of the defamation statutes for alleged derogatory comments about Muhammad, which is punishable by death, though life imprisonment is also possible. Pakistan put a de facto moratorium on executions into place in 2008, though one person has been executed since then. In the harvest fields of Ittan Wali in June 2009, her co-workers objected to her touching the container for the water she had fetched, saying that her Christian faith made it impure for them, and they told her to convert to Islam, according to her husband. Her objections were taken as blasphemy, and they beat her before dragging her to a police station, he said. The Human Rights Commission of Pakistan has stated that Christians and Ahmadis, a minority sect within Islam, are vulnerable to Pakistan’s draconian blasphemy law, according to The New York Times. More than 20 men have been sentenced to death under the blasphemy law, most of them Christians, though none have been executed, human rights groups say. Pakistan’s blasphemy laws have been routinely misused to settle personal scores with false accusations. Police have found most blasphemy accusations to be false during investigation, but accusers can make innocent victims suffer months in jail with quick and easy registration of such cases. Of 5,000 cases registered between 1984 and 2004, only 964 people were charged with blasphemy, according to the Pakistani newspaper Dawn. A recent study by the Centre for Research and Security Studies (CRSS) found that from 1953 to July 2012, there were 434 people blasphemy “offenders” in Pakistan, including 258 Muslims, 114 Christians, 57 Ahmadis and four Hindus. Those acquitted of blasphemy charges also face threats from homicidal vigilantes. Of 52 people extra-judicially murdered after being charged with blasphemy in Pakistan, 25 were Muslims, 15 were Christians, five were Ahmadis, one was Buddhist and one was Hindu, according to the CRSS report. Most blasphemy case acquittals take place at the appellate level, after courts have denied bail so often that the accused spend years in jail, as lower courts tend to decide based on fear of violence by Islamist groups rather than on merit. Section 295-B of Pakistan’s blasphemy statutes makes willful desecration of the Koran or a use of its extract in a derogatory manner punishable with life imprisonment. Section 295-A of the defamation law prohibits injuring or defiling places of worship and “acts intended to outrage religious feelings of any class of citizens.” It is punishable by life imprisonment, which in Pakistan is 25 years. 2 – the Koran commands “Cut off their heads, and cut off the tips of their fingers” (Sura 8:12). if this sentence is carried out, she and other Christians martyred by the islamic heathen will stand at the Judgement and see Mohammed, his false “god” allah and all who have murdered the saints of Christ for just naming His Name above all others, into an eternal lake of burning fire. This is so barbaric and unconscionable. Jesus said those who are without sin let him cast the first stone. Then all these Islamic accusers who are more than anxious to murder this woman will someday stand before God claiming to be perfect? They all stand guilty for being Christianphobic. @Henry – How exactly are Obama or an entire religion responsible for the actions of extremists in this article? Religions all claim to be a religion of peace. That is the very essence of religious belief—central to the noble acts of kindness, tolerance and/or peace. But not to extremists; and every religion has it’s literalists and fundamentalists which have caused great suffering to no end. Christianity is no exception. Consider the Inquisitions, the Crusades and even current militant groups such as Westboro Baptist Church. You can bet that if our laws in the US protected their anti-homosexual agenda and right to enforce anyway they saw fit to carry out “God’s wrath” that carrying out death sentences wouldn’t be far behind. One thing all extremists have in common is ignorant followers, a lack of tolerance or acceptance of others (including bigotry, prejudice and racism) and a great propensity towards violence. These are things Christ vehemently stood against: “Let he who is without sin cast the first stone.” If you believe in anything that the good book tells us then be careful where you point your finger in judgement against others. That is God’s place—not ours. Anything contrary to the word is blasphemy and sinful. Right? I’m glad that I live in a country that has the freedom of speech. I blaspheme constantly.